In Washington State, Prohibition lasted from 1916 until 1933. Local police and federal agents made regular raids and arrests. Circa 1921. At the new MOHAI show, “American Spirits: The Rise and Fall of Prohibition,” Maria Lunder, 10, of Seattle, tries to do the “Charleston” dance, using the foot prints on the dance floor. At the new MOHAI show, “American Spirits: The Rise and Fall of Prohibition”, a wall displays vintage police photos of bootleggers. The Museum Pass allows you to use your Seattle Public Library card to reserve and print out an admission pass to participating Seattle museums at no charge. This entry was posted in Community, Events, Free Stuff, Seattle and tagged Event, events, exhibits, history, museums, Seattle on May 27, 2015 by CynthiaB. Seattle Underground Tour – definitely recommended! Bill Speidel’s Underground Tour is a world-famous tour that I would definitely recommend. Starting in Doc Maynard’s Public House – a saloon from the 1890s, the tour takes you across Pioneer Square and eventually makes its way underground. At the first site is one of the first flush toilets in Seattle, invented by Thomas Crapper. The same site holds props from the 1973 movie The Night Strangler: a decorative wooden door, and a beaten up red couch. From there, the tour moves on to the second site. Though it may seem like a giant wall of bricks, it is actually proof of the fact that Seattle was built on sawdust. 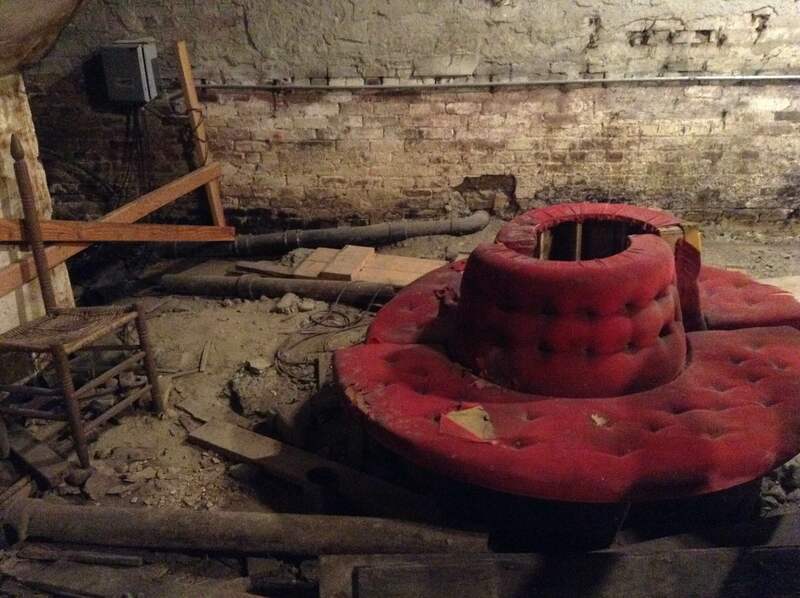 Considered to be Seattle’s first economic father, Henry Yesler himself stated “We commenced sawing wood under a shed in March ’53; the saw dust we filled swamps with, and the slabs we built a wharf with.” The third and final underground site presents an old bathtub. Not every house had a bathtub and most settlers had one bath a month; once a bathtub was filled with water, a dollar would be charged to first person in the bathtub, fifty cents to the second, a quarter to the third person, and so on. Imagine paying fifty cents to bathe in dirty water! The tour ends in Rogues Gallery, the Underground Tour gift shop. It features a fancy porcelain crapper imported from England, antique typewriters, and much more. Taking the tour is a very engaging experience that reveals little-known facts about Seattle. The tour guides are very engaging and tell you several stories, ranging from ghost stories to embarrassing stories that our early settlers wouldn’t want you to know. This entry was posted in Read This!, Seattle, Teen Powered, Weird and tagged bysplteens, Seattle, Underground Tour, written by teens on March 14, 2015 by Teen Blogger. Like theater? Like funny things? Like Tina Fey or Amy Poehler? Then do I have the weekend event for you! Jet City Improv, Seattle’s own Improv Theater is hosting their annual Seattle Open this weekend! The Seattle Open is an improv competition for high school teams where students are judged based on their energy, creativity, and of course, improv. Watch some of western Washington’s most talented high school improvisers in the Semi-Finals and the Finals of the competition this weekend! Returning champs Charles Wright Academy will be there, along with two teams from Ingraham High School and representatives from three other schools! The preliminary round of the competition was last weekend letting only six out of eleven teams through to the second round. The competition will be held at Jet City Improv in the University district and tickets are free (there is a $5 suggested donation)! These students are crazy talented and it is sure to be an entertaining event! Or if for some crazy reason you have plans this weekend and can’t make it, Jet City is a great place to go year round. They often have themed long-form shows running, as well as their usual Jet City show. It’s fun for everyone and always a good time! Support local improv, local theater and local students and come on out to Jet City this weekend!!! This entry was posted in Community, Events, Read This!, Seattle, Teen Powered and tagged bysplteens, comedians, Comedy, competition, high school, improv, Jet City Improv, Seattle, Theater, written by teens on March 12, 2015 by Teen Blogger.